The Shawnee Mission Health Hybrid Operating Room opened to patients on February 7th. The 3,550 square foot surgical space, the largest hybrid operating room in Kansas City, was converted from an outdated clinical area and was designed to enhance patient safety and outcomes. The multidisciplinary space allows healthcare professionals from different specialties to treat patients in the same location. 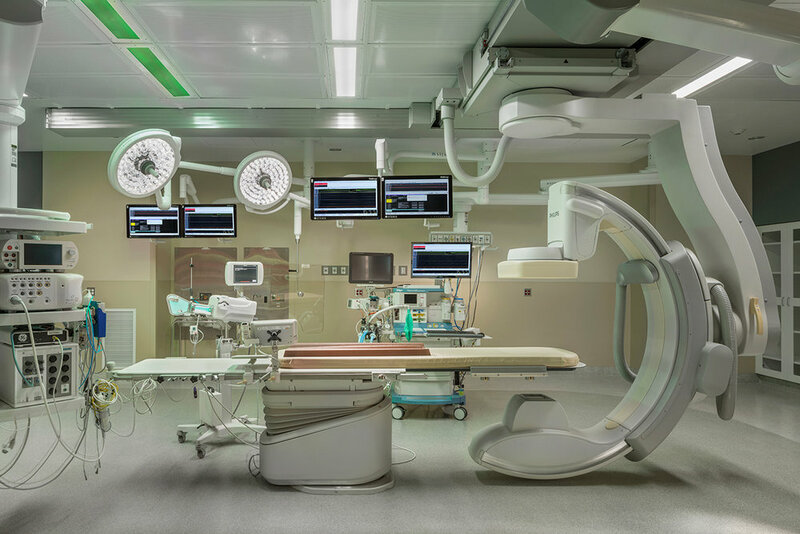 With the help of virtual reality, Pulse Design Group developed a flexible design for the Shawnee Mission Health Hybrid Operating Room that could be modified in the field to manage the equipment required for an operating room, along with the technology for a radiology room. Click here for more insight on the Shawnee Mission Health Hybrid Operating Room from MetroWire Media. Millions of prescriptions are compounded by pharmacists, nurses and doctors each year in the United States to meet the unique needs of patients who otherwise may not have access to the required medicine in the right concentration or dosage. Understanding of the inherent risks of compounding and incorporating established USP standards into everyday practices is essential for patient and staff safety. New regulations set forth by the United States Pharmacopeia’s USP 797 and USP 800 were recently established and adopted to include workroom air pressure requirements, specialized work flows, isolation measures and sterility conditions related to compounding. What do these new standards involve and what do they mean for healthcare organizations? USP 797 helps to ensure patients receive quality preparations that are free from contaminants and are consistent in intended identity, strength and potency. It describes a number of requirements including responsibilities of compounding personnel, training, environmental monitoring, storage and testing of finished preparation. USP 800 provides standards for safe handling of hazardous drugs to minimize the risk of exposure to healthcare personnel, patients and the environment. USP 800 deals with product transport, product storage, compounding, preparation, and administration of products. The regulations exact enforcement fluctuates by state, however current USP mandates require that compliant facilities and practices must be implemented by December 31, 2019. These new statutes affect public and private sector pharmacies and will require, in many cases, substantial capital investments in infrastructure and personnel to meet the new regulations. USP 797 and 800 standards have pushed architectural firms to come up with creative design solutions to help healthcare systems meet compliance standards while being mindful of the organizations bottom line. One effective design solution for clean room pharmacy compliance and upgrades is the utilization of specialized pass-throughs, which is commonly used in pharmacies for drug preparation. Clean rooms are pressurized and sterile to ensure that drugs are safe. Pass-throughs are two-sided cabinets built into a wall to connect the pharmacy and the clean room for the transfer of supplies and drugs without jeopardizing sterility. When done properly, only one door of the pass-through can be open at a time, which keeps the pressurized system intact, preventing any contaminants from entering the clean room. In the past, most pass-throughs were constructed of stainless steel and involved mechanical interlocks, but recently there have been newly developed systems that effectively utilize solid surface. The advantages of solid surface includes its properties of being nonporous, bacteria-resistant, stain resistant and durable, which makes it well-suited for sterile environments. Other benefits include its ability to be fully seamless for cleaning and is typically less expensive to fabricate than stainless steel. Moreover, the material’s flexibility easily integrates electrical fixtures better than other products. The Joint Commission will enforce penalties to healthcare systems that do not meet compliance standards by the established date. Reference the Joint Commission article by clicking here for more information regarding USP 797 and 800 compliance and to understand the benefits of obtaining Medication Compounding Certification. The extent of pharmacy design modifications relies heavily on the compliance of the current space. Not only will the pharmacy design and operations need to be modified to adhere to current regulations, many times the footprint is required to significantly grow. The timing required to implement these measures can be extensive and procedures and operations will likely be affected. Health systems should be preparing compliance plans early to ensure a smooth transition.